The lockstitch is the most popular stitch used in sewing or garment construction. Most people refer to it as the regular straight stitch. If you are looking for a machine which does straight stitching only, the following three are you go tos. This lockstitch machines has several features I like starting with the knee lifter lever. If you are trying to get through a sewing project pretty quickly, this machine allows you the ability to do so hands free. This allows you to power through a project without the hassle of raising a lever each time. The automatic needle threader is another time saving and frustration sparing feature which I really like. The more automated functions the better and this model also comes with an automatic thread cutter, another time saver for fast-paced sewing. This is a true table top portable machine, designed with a carrying handle for easy portability. 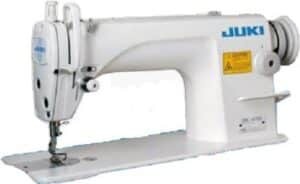 The package offers an exceptional value for money because you’ll be getting 6 presser feet, and an auxiliary table to expand the sewing surface. A large extension table is included to give you an even greater sewing surface. You’ll also receive tools and accessories for cleaning and maintenance, including an oiler and an exclusive screwdriver. 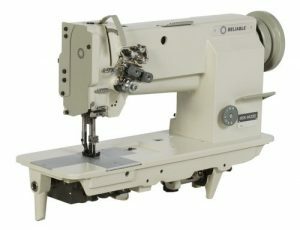 If you are looking for a more heavy duty lockstitch machine then this next model may be what you are in the market for. The name of brand tells a lot about the performance. This heavy duty high quality lockstitch sewing machine operates at 2000 revs per minute. Despite its heavy duty nature, it is designed with a Reliable 6000 SM SEWQUIET SERVOMOTOR, for a comfortable level of sewing noise during operation. Best suited to medium to heavy weight fabrics, you can tackle your canvas, leather and upholstery projects with ease on this machine. Just ensure that you are using heavier thread for these projects. A walking foot which comes with the package assures that you’ll have minimal issues with fabric snagging. Interestingly, it can accommodate two needles, which is not typical of lockstitch sewing machines. This particular model is designed to be anchored to a table top and so is not a true portable machine. This is expected since the machine is so powerful and needs to be properly anchored for stability and to prevent travelling during sewing. The knee lift helps you to be able to sew quickly and hassle free. The stitch length can be adjusted up to 10mm and the machine has a reverse lever on the right side for back tacking. What inspires further confidence in me about this machine is that every single unit is individually tested before it is shipped out. I imagine that this is the only way the company will truly be able to live up to its name and provide reliable products. A sturdy stand with a plywood table top is included complete with steel leg supports and a motor. 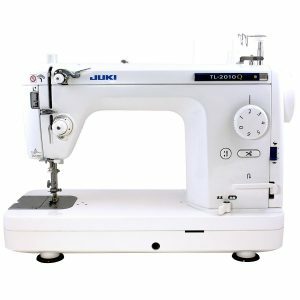 This Juki heavy duty table top lockstitch is quite powerful, operating at 5500 stitches per minute. For me, the only drawback is the way it is shipped. The company sends it in three separate boxes which means that assembly is required. If you are not able to fit the pieces together yourself, you will have to seek the services of a technician at additional cost. In addition, assembly details are not included so the job of putting it together really calls for someone with know-how. It is also designed for medium to heavy weight fabrics and uses needle sizes from 9 to 24. The arm area is quite spacious so you can comfortably work on larger projects without hindrance. The knee lifter also makes for fast sewing pace. Oiling tends to be a little tedious for most people and generally requires use of the manual until you become fully familiar with your machine. The good news about this model is that it is made with a fully automatic lubrication system and is also eco friendly in its design. The table which comes with it also needs to be assembled, and you get a few accessories, oil and the user manual.